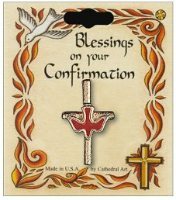 DIVINE CHRISTIAN GIFTS - Gold Confirmation Cross and Dove Pin. Gold Confirmation Cross and Dove Pin. Confirmation cross and dove pin.